This past week has been a roller coaster. Waiting on pathology and waiting for our other two children to arrive safely from the opposite side of the state and waiting to get their eyes examined and waiting to hear if their eyes looked okay. …waiting and trusting. I had a bad case of nervous stomach for 6 days. But, we had a lot to keep ourselves busy. Mom and Dad came to Memphis to help and support us, and love on Willa, of course! They arrived Monday evening. The next day, Steven’s parents arrived with Finn and Johnnie and then things got real exciting! We missed those kids like crazy. I had forgotten how easily little ones can wear you out, but it is so worth the exhaustion. I was a little worried about how they would react when they saw Willa’s eye. It did not phase them one bit. Finn wanted to make sure she was okay, but they didn’t shy away from her at all. Children are so amazing. 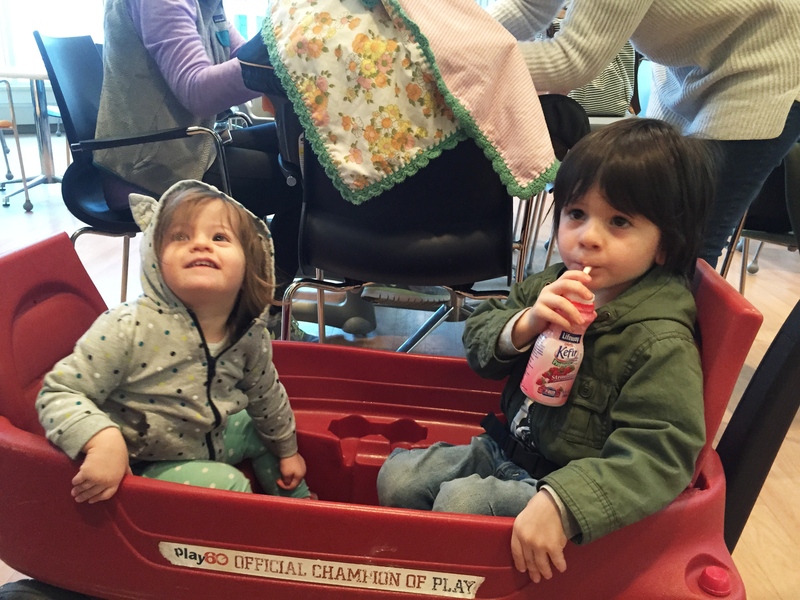 Our good friends’ kids were the same when we visited them for lunch earlier in the week. I was worried the sight of sutured eyelids would frighten them, but they were just incredibly loving and curious. 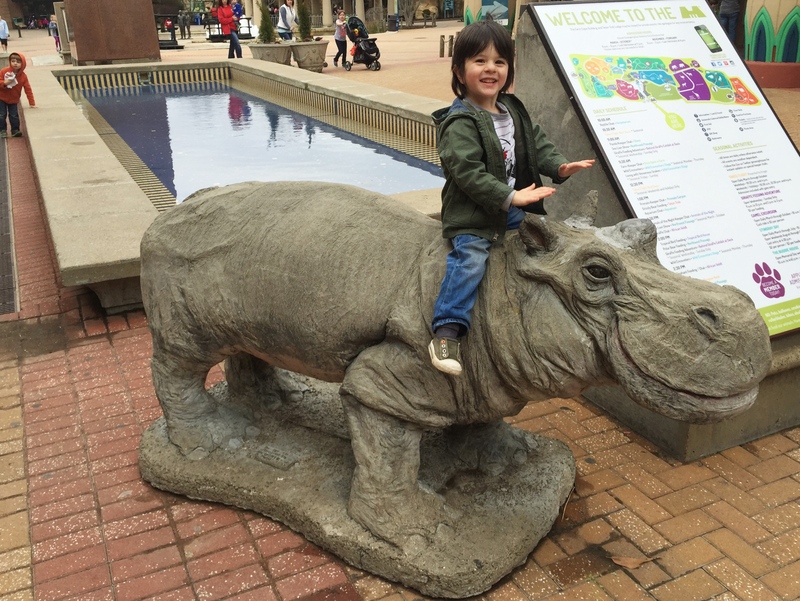 We were able to get out and go to the Memphis Zoo on Wednesday. I tried to enjoy it, but swirling around in my mind were all the unknowns that were upon us, and I couldn’t stop thinking about Willa’s temporary IJ line that was sticking out of her neck and pulling at her skin every time she turned her head. At the right angle, I could catch a glimpse behind the dressing at the sutures that were holding the line in place. Her sweet little skin being pulled like that reminded me of fishing when I was a kid, and having to pull the hook out of the fish’s mouth. Agh! Even if Willa had gotten used to it, I never did. I hated that thing. We were asked to keep it in place for at least 7 days, while we waited for her pathology results, just in case she needed chemo, then they could just go back and “re-wire” it to make it permanent. Each day we had to go to the hospital to get it flushed. Nurses made comments (in the best baby talk) like “How could they do this to you, you shweet thangs?? They needs a spankins’!” One of our favorite nurses, Keisha (who held me when I couldn’t handle seeing Willa poked on day 1), was the best at being so gentle with Willa’s line. Each day we told her more and more of Willa’s story and our lives. She is amazing. Right after her temporary IJ line was removed. SO glad to be rid of that sucker. Then it was time for Finn and Johnnie’s exams. They hated the eyedrops. My goodness is Finn a fighter! 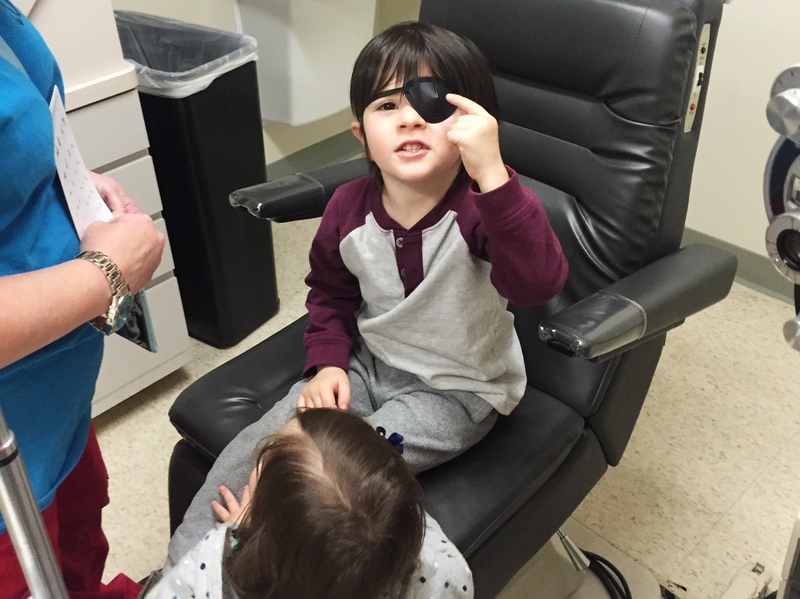 But, of course, afterward he kind of wipes his hair out of his eyes and says “that didn’t hurt at all!” Finn got a free eyepatch out of that. Looks just like Kwazy’s from Octonauts. Most legit pirate eyepatch ever. Dr. Wilson is so cool. I mean really, he is. A glance through some fancy round lens into Finn’s eyes looking left, right, up, down, and then I heard “Perfect! They look great!” RELIEF. Two-thirds of the weight off of my shoulders! We all clapped…..and then Finn played on our Child Life Specialist’s iPad. Johnnie’s turn. A glance through some fancy round lens into Johnnie’s eyes, a flashlight, and then…ULTRASOUND?! My heart started racing. Ultrasound? Why does he need to do an ultrasound? What did he see??? On the screen, I strained my eyes to look for what he had been so concerned about that he needed to do an ultrasound of her eyes. I think I stopped breathing. But then…”Perfect! All four eyes are perfect.” PHEWWWWW! 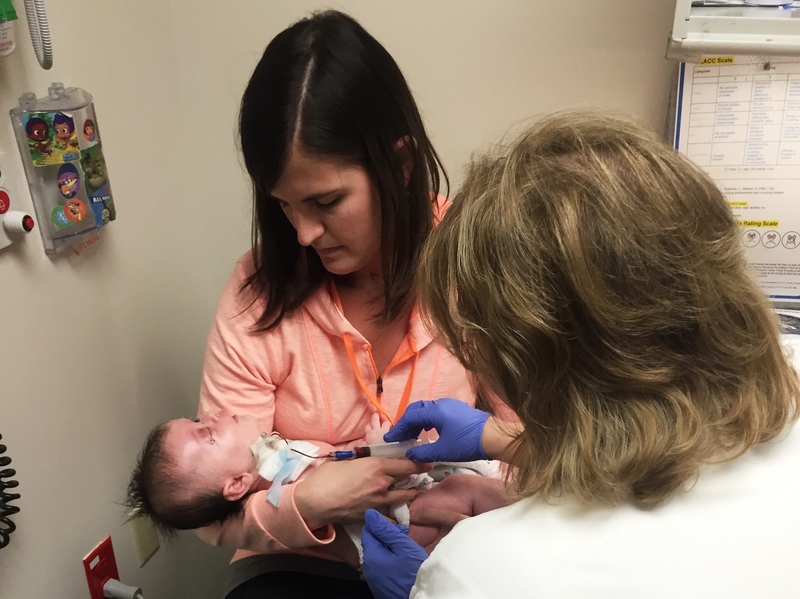 …The ultrasound was just used because she’s too young to listen and look in different directions for Dr. Wilson to have gotten a good look at her eyes. After the kids passed with flying colors, I didn’t have a care in the world. I knew it was going to be OK. I knew that Willa wouldn’t have to have chemo. I just knew. I had a renewed joy. I even gave the kids a Twix and the melted chocolate that ended up all over everything didn’t even phase me. They don’t have Retinoblastoma. Their eyes are healthy. They could’ve done just about anything at this point and gotten away with it. I didn’t care. They were healthy!!!! Then Dookers and Wubbs (Mom and Dad) left to catch their flight home while Papa and Peaches (Jeff and Debbie) took Finn and Johnnie back to their hotel for a nap. I was feeding a dozing Willa back at our housing. It was so quiet. And Steven and I knew it would only be an hour or two before we heard results. I was staring down at Willa, watching her eye get heavy, opening and slowly closing, when Steven’s phone rang. My heart leapt out of my chest. I don’t even remember what he said to Tracy on the phone, I just remember he turned toward me and threw his fist up in the air! HOORAH! The happy sobs were uncontrollable. It was the kind of crying where there aren’t many tears, but your whole torso shakes and your shoulders double over. 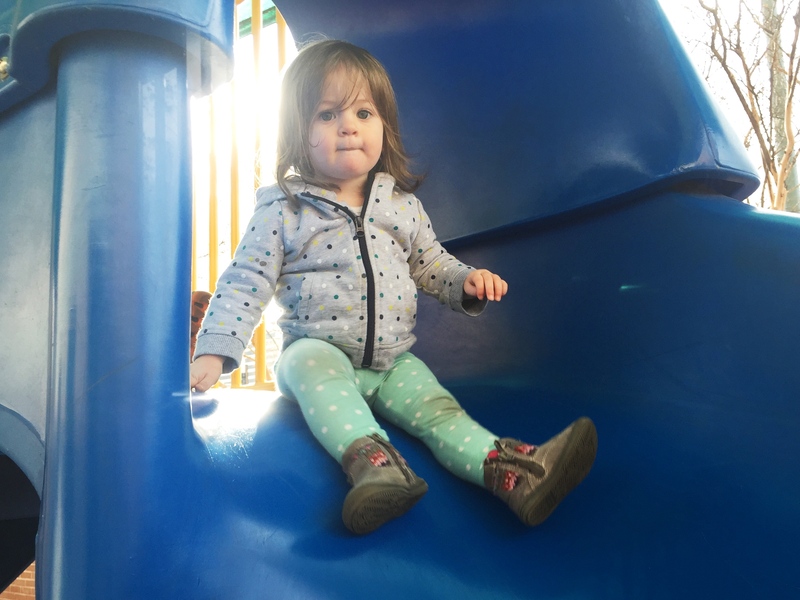 I held onto Willa and marveled at God’s love for us. Her little body was rocking up and down because I couldn’t stop with the whole shaky cry-thing I had going on. Now, I’m sitting in our hotel room in Nashville. Tomorrow, we will be home. HOME! 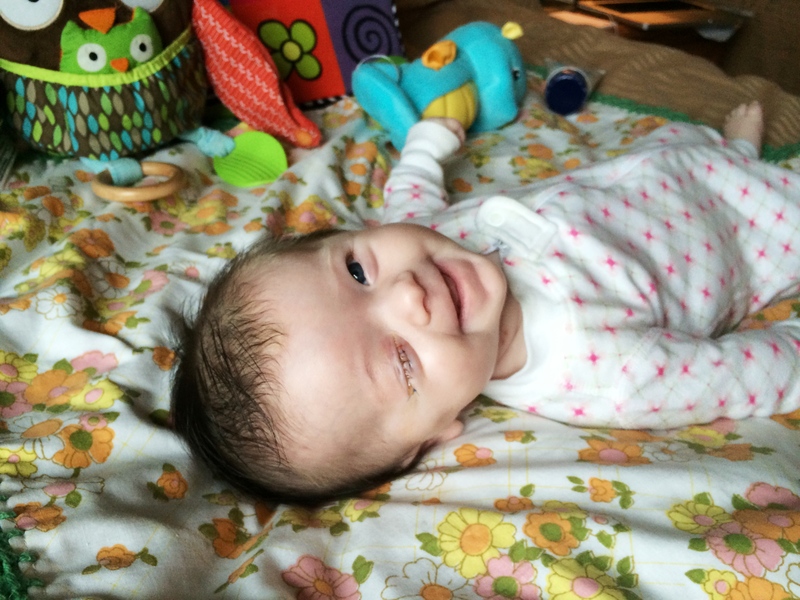 Willa’s journey with Retinoblastoma isn’t over. We return to St. Jude at the end of April for another EUA (I think), to get her sutures removed, and a fitting for her prosthetic eye(I think). We are waiting on genetic testing results, which take about 6-8 weeks. We still don’t know if Willa has Unilateral or Bilateral. 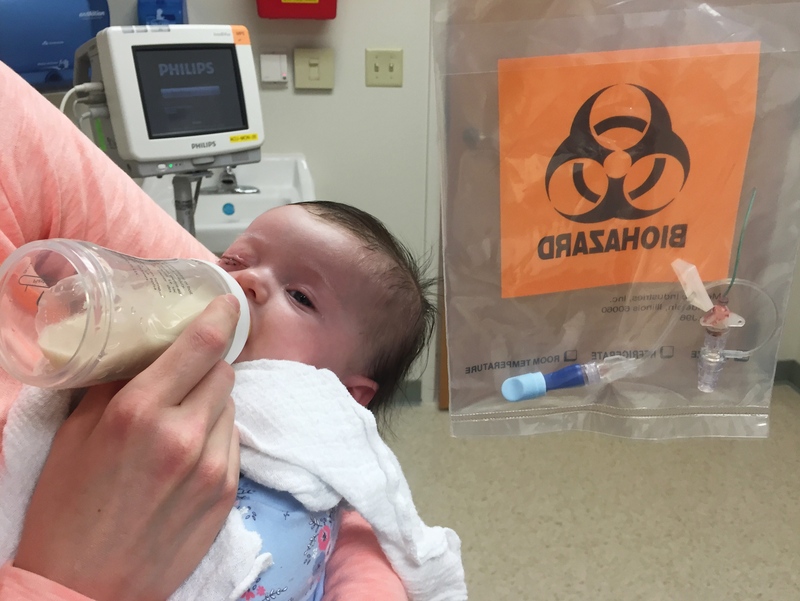 Since she is so young, it’s possible that tumors just haven’t developed in her left eye yet, so that’s why her exams and future scans are so important. If caught early enough, if anything were to develop in her left eye later on, they would be treated by laser or cryotherapy. Is it strange to say that I’m excited to return? I love St. Jude. I love that my heart has been made aware of the reality of childhood cancer. I will never be the same. In the past three weeks I have been more aware of our desperate state and The LORD’s perfect ability to reach down and carry us through some of our darkest hours than ever before. I love St. Jude because Jesus is so evident and so alive there. Hope and glory ring out louder when you and everyone around you is walking through a valley. Praising God with a grateful heart because of His goodness and care for your precious family! Thank you for the blessing of the precious peek into your thanksgiving! What a blessing to hear your family sing my favorite hymn. God’s Amazing Grace! Praise God from whom ALL blessings flow! Oh… Such good news. And so bittersweet to see her little eye, but such a small price to pay… She will never remember any other way. You know? Such a roller coaster you’ve been on… I pray for normal from here on out. You’ve handled this with such am amazing heart. Love and prayers. Thank you for this amazing inside look at your family. You have more faith than anybody I have ever known. I just wanted to tell you that Jim’s nephew lost an eye in an accident when he was young. He is now approaching 30 and you would never know by looking at him. I have watched you and cried with you through this ordeal and now I rejoice with you as you go home and resume your normal lives. Much love and prayers from our family. Praise sweet Jesus! I am so happy for the news! I will keep praying. Praise God! I was thrilled to read your post today! Baby Willa has been in our prayers and will continue to be! In Christ’s love, your Pine timbers neighbor. Praise God!!! We are so happy and thankful for your great news! Love and hugs! it all in. 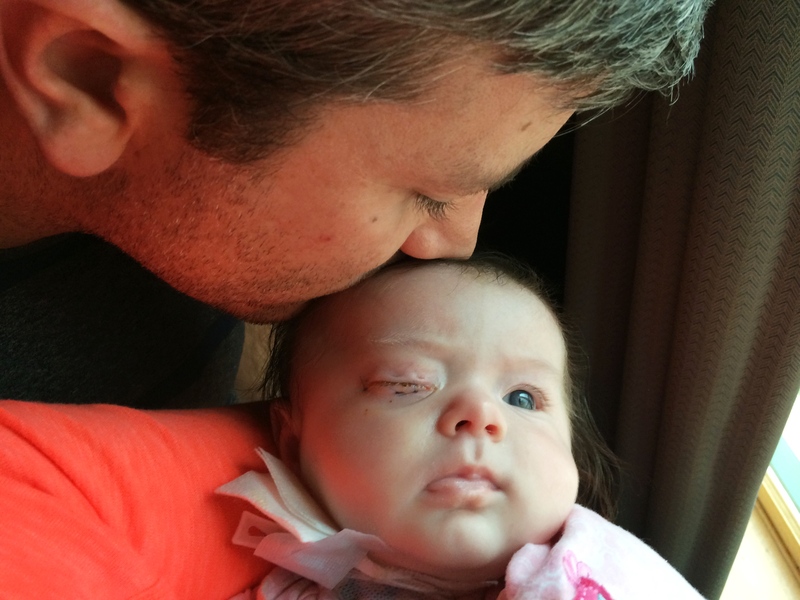 I’m so glad her condition is hopeful and that St. Jude’s will continue to check her other eye. Your family has been blessed and has been a blessing. Faith is clinging to God when we realize we have zero control over anything. Every day of life is one of His many gifts. Precious praise! Just precious! To HIM be ALL glory!!!! We feel so connected to you as grandparents of another miracle St Jude child. Your words are powerful and reflective of a very much alive Jesus the Christ. Our hearts and prayers go with you as you continue on this journey. God is Good! Prayers are answered. I wil continue to pray for Willa and you and your family. Warms my heart to see your precious children, hugs to all of you. A picture of your lil Willa showed up in my popular feed on IG. I thought the quilt she laid on was pretty so I clicked the picture. I then discovered she had retinoblastoma and I was immediately reminded of our friend whose son had same. His father even went on to develop an app to help diagnosis. Please check out this article if you feel inclined. God is faithful! Oh wow!! yes I have heard of the app, how awesome that you know him!!! I want to learn more about the app and the whole story. I’ll definitely check that out! Thank you!